Nordic Naturals Arctic Cod Liver Oil is a dietary supplement containing Arctic cod liver oil, obtained from wildly caught fish. The preparation has been subjected to numerous analyzes confirming the freshness and purity of the oil. The product was designed to respect the environment and zero waste principles. 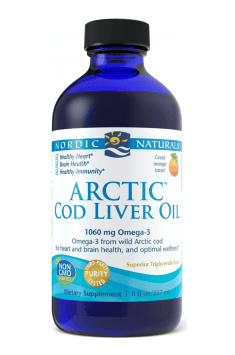 Arctic cod-liver oil is a source of valuable omega-3 fatty acids – EPA and DHA and natural vitamins A and D. Users can choose from three available flavors or they can go for a bland-tasting version. Eicosapentaenoic acid (EPA) and docosahexaenoic acid (DHA) are polyunsaturated fatty acids belonging to the group of EUFAs – Essential Unsaturated Fatty Acids from the omega-3 family. As the name suggests – these are the compounds essential to the system and they must be necessarily provided with a diet. EUFAs from the omega-3 group perform a number of important functions and demonstrate a proven beneficial effect on health. In the era of widespread environmental pollution, the best source of these compounds seems to be an adequate supplementation with high-quality purified fish oil, free of heavy metals and other environmental toxins. Cod-liver oil is the so-called functional food, which, accordingly to the guidelines of Food for Specified Health Uses, should not only nourish but also have a beneficial effect on the human health. The EUFAs from the omega-3 family contained in the cod-liver oil reduce the mortality of the population, lower the incidence number of cardiovascular disease and improve the lipid profile, as well as they have a beneficial effect on the functioning of the brain. In addition, the presence of omega-3 fatty acids in children's diet correlates with their normal development. EPA and DHA form eicosanoids, which include prostaglandins and thromboxanes. They are active compounds that have a wide range of metabolic functions. Eicosanoids formed from omega-3 acids display, among others, anti-inflammatory, anti-atherosclerotic, and anti-thrombotic effects, as well as they lower blood pressure and blood triglyceride level. A number of clinical trials have been carried out to confirm the aforementioned effects of omega-3 fatty acids on the cardiovascular system. An appropriate supplementation of EPA and DHA results in, among others, reduction of endothelial dysfunction and improvement of insulin sensitivity. EPA and DHA are part of retinal structures. Due to their anti-inflammatory activity, they may have a positive effect on eye health, as evidenced by numerous cohort studies. Inflammation within the eye organs stimulates angiogenesis process, which can lead to the development of age-related macular degeneration (AMD) – a disease that is the main reason for the loss of sight. Omega-3 acids may also reduce the symptoms of dry eye syndrome. In combination with the natural vitamin A, which has antioxidant properties and is essential for normal vision processes, cod-liver oil is an agent that effectively supports healthy eyesight. An optimal supply of EPA and DHA is important for the brain health – according to estimates, DHA may account for up to 40% of the fatty acids of the cell membranes of the gray matter cells. What's more, in people with dementia this value is reduced. This is why omega-3 acids are important for the proper functioning of the central nervous system, as demonstrated in several studies. It has been proven that adequate DHA supply influences the increase of BDNF level, that is the neurotrophic agent of cerebral origin. It is a protein released by neurons, which contribute to, among others, the improvement of cognitive functions. Vitamin D is, next to vitamin A, another fat-soluble vitamin found in cod-liver oil. The main function of vitamin D is the regulation of the calcium-phosphate metabolism, crucial for optimal bone mineralization and health of the motor system. In addition, this vitamin has a number of other important functions in the body – it has e.g. immunomodulatory, anti-inflammatory, neuroprotective and anti-proliferative properties. An appropriate level of vitamin D reduces the risk of developing cardiovascular diseases, diabetes, and metabolic syndrome. Vitamin D also has beneficial effects on muscle regeneration. In conclusion, Nordic Naturals Arctic Cod Liver Oil is a valuable dietary supplement recommended for regular supplementation in order to strengthen immunity, support cognitive functions, improve general health and prevent civilization diseases. Take one teaspoon daily, with food, or as directed by a healthcare professional or pharmacist. The product should be stored in a refrigerator and used within 3 months after opening. Due to the presence of fat-soluble vitamins, it is advisable to combine the product with a fat-containing meal. Do not use cod-liver oil if you are taking blood thinners and before a surgery. Purified cod-liver oil, natural lemon/orange/strawberry aroma (depending on the flavor chosen), d-alpha tocopherol, rosemary extract (a natural preservative).